One winner gets it all. 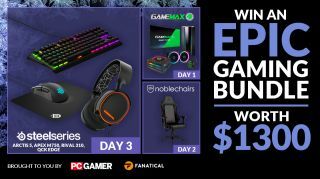 The final of our Fanatical prizes can be revealed today: it's a set of SteelSeries goodies, including an Arctis 5 Headset worth $100, a high-end Rival 310 gaming mouse and more. This is to celebrate the launch of Fanatical's winter sale, where a bunch of the year's best games are deeply discounted. These join a noblechairs luxury gaming chair and a GameMax PC building kit in the prize package. One random winner will get it all—and collectively, that's $1,300 worth of prizes. Fanatical is operating the competition via the widget below, and they'll mail prizes anywhere in the world. You'll find the terms and conditions at the bottom of the widget—and you can enter in a whole bunch of ways. The competition ends on January 2nd 2019 at 8AM UK time, and Fanatical will pick a winner the day after. Good luck!